Whether G20 countries embrace responsible climate policy is of critical importance, since together they account for roughly 80 percent of global greenhouse gas emissions and 80 percent of global GDP. German Chancellor Angela Merkel has announced responsible climate policy as a goal of this year's G20 Summit in July. In the lead up to the Summit, WRI researchers will take a close look at G20 countries' progress toward meeting their targets under the Paris Agreement as part of our G20 Climate Progress blog series. As climate negotiators met in Bonn, Germany, Indian Energy Minister Shri Piyush Goyal offered a bold assertion about his country's role in implementing the Paris Agreement: "India stands committed to its commitments made at Paris irrespective of what happens in the rest of the world." Goyal's remarks come before India takes part in next Monday's facilitative sharing of views in Bonn. During this session, select developing countries will discuss progress on climate action, aiming to increase transparency under the international framework. Developed countries such as the United States, Russia and Japan are participating in a similar but slightly more rigorous discussion, called a multilateral assessment," today and Saturday. In 2015, India announced an ambitious goal of to increasing renewable power capacity to 175 gigawatts (GW) by 2022, with 100 GW of solar, 60 GW of wind, 10 GW of bioenergy and 5 GW of small hydro. That would mean increasing renewable power capacity fivefold in seven years, making India a clean energy leader. India has also set year-on-year targets, which chart a roadmap to achieve the 2022 goal. So how is India faring against its annual targets and progressing toward the 2022 goal? Recently released preliminary capacity data for the last fiscal year offers clues about where India stands on meeting its ambitious goals. In fiscal 2017, India added 5.5 GW of new wind capacity, exceeding the 4 GW annual target. It also surpassed the previous year's wind capacity addition of 3.4 GW. This was supported by several new enabling policies, including updated guidelines for the development of wind power projects and the introduction of competitive tariff bidding in wind energy auctions. India is now the fourth largest installer of wind power in the world, after China, the United States and Germany. 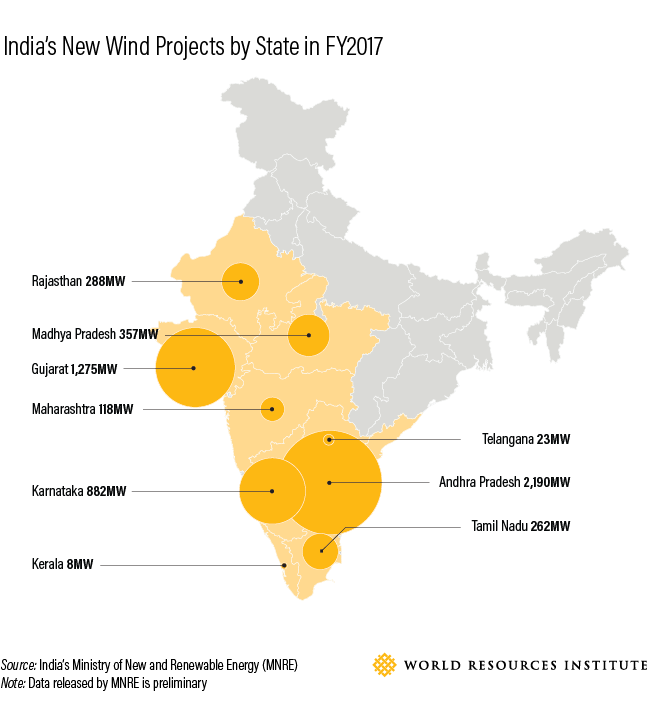 The states of Andhra Pradesh, Gujarat and Karnataka saw the largest wind capacity additions in the last financial year (collectively contributing to more than four-fifths of new capacity additions in FY2017). India added 5.5 GW of new solar capacity in the last fiscal year, 50 percent over the previous year. 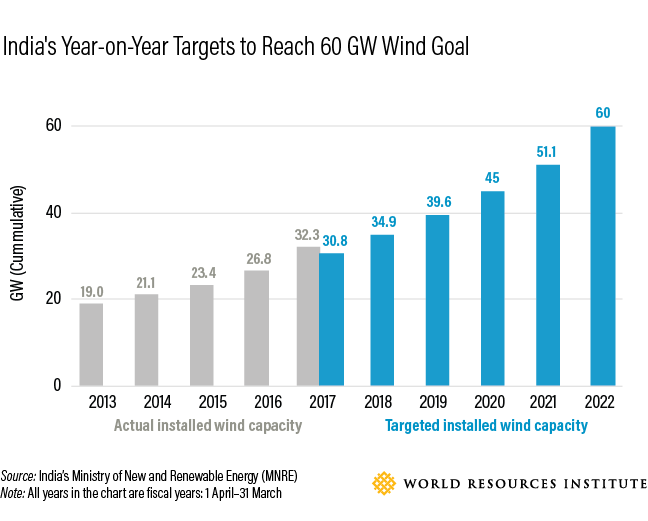 While impressive, the country fell short of its 12 GW annual target. Slow progress on solar rooftop installations, poor transmission infrastructure and lack of access to finance have impeded growth. 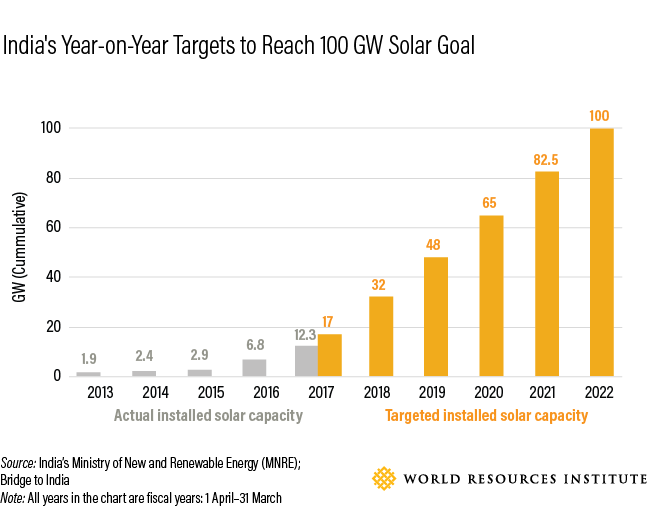 India will need to increase the rate of solar capacity additions to at least 18 GW per year if it is to reach the 100 GW goal in 2022. Recent low solar prices may spur growth, making renewable power an increasingly competitive energy resource. On Tuesday, the price of solar fell to a record low of 2.62 rupees (4 U.S cents) a kilowatt-hour in a competitive bidding process to add 250 MW of capacity to solar plant in Rajasthan. This bid beat a previous record set in April (3.15 rupees a kilowatt-hour) to build a 250 MW solar plant in Andhra Pradesh. India's total installed renewable power capacity stands at 57 GW, more than double the country's installed capacity just four years ago. However, to meet the 2022 target, India will now need to significantly step up the pace of renewable capacity additions, from an average of 11 GW per year to least 24 GW per year. Reaching this target will support India's draft electricity plan, which indicates an increase in the share of non-fossil fuel based power capacity to around 57 percent by 2027 (from around 32 percent today), which is notably higher than the international commitment of 40 percent by 2030, conditional on technological and capacity-building support from developed countries. As India focuses on increasing its renewable energy base, it will need to simultaneously reduce dependence on coal while meeting the energy needs of a growing population. Encouragingly, the new draft electricity plan shows quite limited growth in coal capacity over the next decade. Moreover, according to CoalSwarm, India had shelved more than 82 GW of planned coal capacity by the end of 2016. Shifting investments from fossil fuel-based infrastructure toward renewables will be essential to keep the global increase in temperature to well below 2 degrees C (3.6 degrees F) above pre-industrial levels. Meeting India's ambitious climate and renewable energy goals won't be easy. But it is abundantly clear that the country's leadership is fully committed to reaching them.